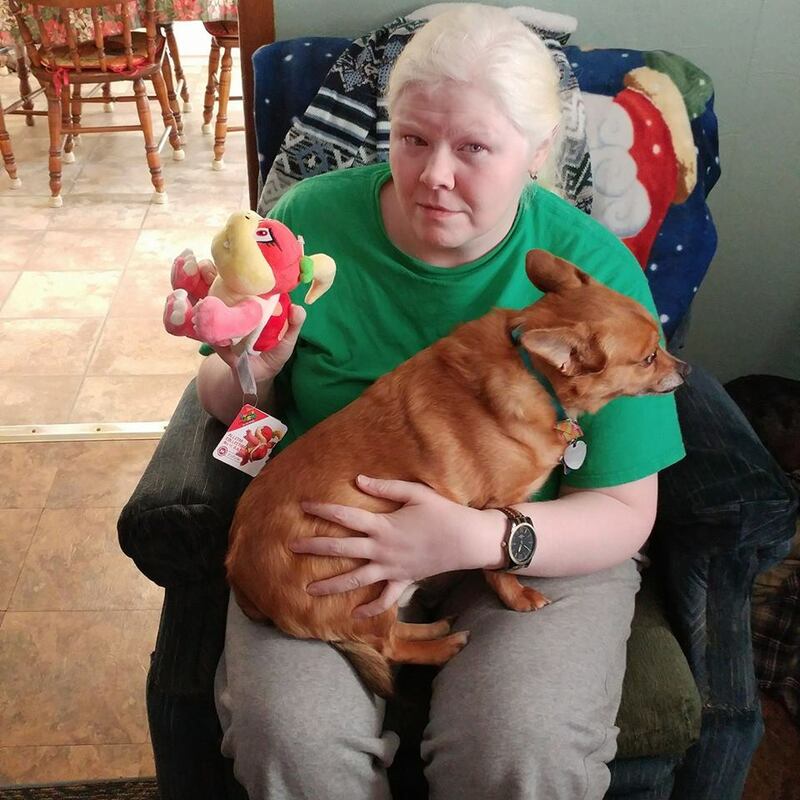 I’ve been collecting stuffed characters from the Mario series, and for Christmas Beth gave me Pom Pom, whom she said was her equivalent. Neither of us are that familiar with any of the games in which the character appears, though. She’s basically the Ms. Male Character version of Boom Boom, who first showed up in Super Mario Bros. 3. His name is sometimes hyphenated or spelled in all capitals, but it seems like the two-word spelling with normal capitalization has become standard. Regardless, he’s the boss of every fortress in the game; as well as the battleships, mini-airships, and super tanks in Dark Land. As such, he’s presumably a pretty high-ranking member of the Koopa Troop, despite not being much of a strategist. I suppose he’s kind of a rage-fueled berserker, although he does have some method to his madness. His standard attack is to run around and flail his long arms, something I’ve occasionally seen actual people do. He sometimes jumps or ducks into his spiked shell. You have to stomp on him three times to defeat him, and he gets faster each time. In some later fights, he can fly. When he showed up in the SMB3 cartoon, he never talked, but just growled. He was also in a few of the Nintendo Adventure Books. In Koopa Capers, his socks are required for a spell Wendy O. Koopa is trying to cast, and Luigi has to find them first in order to get the best ending. Those socks have probably developed some entirely new species of fungus. It was twenty-three years before Boom Boom would appear in another game, Super Mario 3D Land, for which the developers had wanted to bring back some stuff from SMB3. 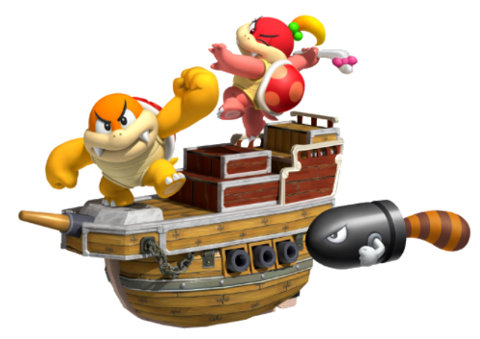 The idea of fortresses with mini-bosses was used in other games, but different characters took the role, like the Reznors in Super Mario World (and later New Super Mario Bros. 2) and Bowser Jr. in the first New Super Mario Bros.
3D Land makes Boom Boom the boss of many of the airships, and this time he can spin around in circles, although it makes him dizzy. He also bounces around the room in his shell after being stomped, and this time the shell doesn’t have the spikes. This is also the game that introduces Pom Pom, referred to in a Prima strategy guide as Boom Boom’s sister, although I don’t think this was confirmed anywhere else. I think it might also have been one of these guides that said Toadette was Toad’s sister, and we don’t know whether that’s true either. We don’t even know for sure whether there’s only one Boom Boom and Pom Pom or many of each. Anyway, Pom Pom is smaller than her male counterpart, and has features that are typical shortcuts to distinguish a female character: prominent use of the color pink, a blonde ponytail, and of course visible eyelashes. 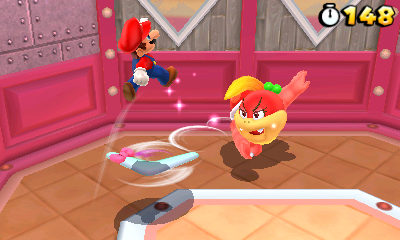 In this game, she attacks with boomerangs, and the two of them sometimes team up. 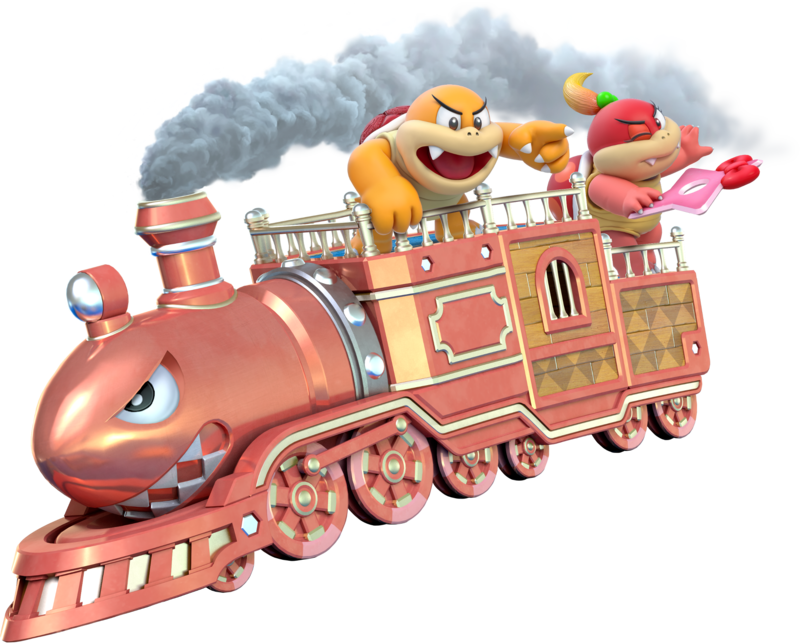 When both characters reappear in Super Mario 3D World, she’s gained some magical ninja abilities, being able to disappear in smoke and create duplicates of herself. She also uses shuriken instead of boomerangs. Boom Boom also has some additional powers, being able to turn almost invisible and create copies of his shell. It can be difficult to show personality with bosses, as they have to have some kind of pattern to their movements, but I imagine Pom Pom as craftier than her possible brother. It isn’t only in these 3D games that Boom Boom makes return appearances, but also in New Super Mario Bros. U and Super Mario Run, in which he has the spikes on his shell again. Pom Pom isn’t in either of these, and I don’t think she’s ever been shown with a spiked shell. 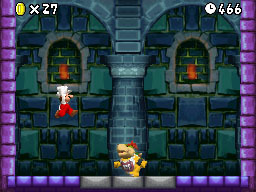 In the former game, Kamek gives Boom Boom a different power for each battle. I guess it’s no surprise that, once Nintendo let him back out, he just kept going. Both he and Pom Pom are in some sports titles as well. 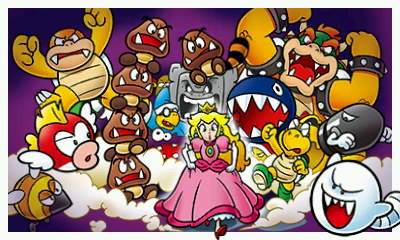 I always kind of wonder how Bowser decides which troops to use during a particular attack on the Mushroom Kingdom or other place. Maybe it’s just the ones who happen to be around at the time. This entry was posted in Cartoons, Gender, Mario, Television, Toys, Video Games and tagged airships, boom-boom, bowser koopa jr., kamek, king bowser koopa, koopa capers, new super mario bros. u, nintendo adventure books, pom pom, super mario 3d land, super mario 3d world, super mario bros. 3, super mario run, wendy o. koopa. Bookmark the permalink.